According to Australian chef and Thai food expert, David Thompson, it came about as the result of a nationwide competition under the military regime of Martial Phibun. In an attempt to revive the Thai economy by encouraging the production of rice noodles, he tasked the country with devising new noodle-based recipes. Salty, sweet and sour with the crunch of peanut and a kick of lime, the winning recipe was named pad thai, or ‘fried Thai style’. The rest, as they say, is history. 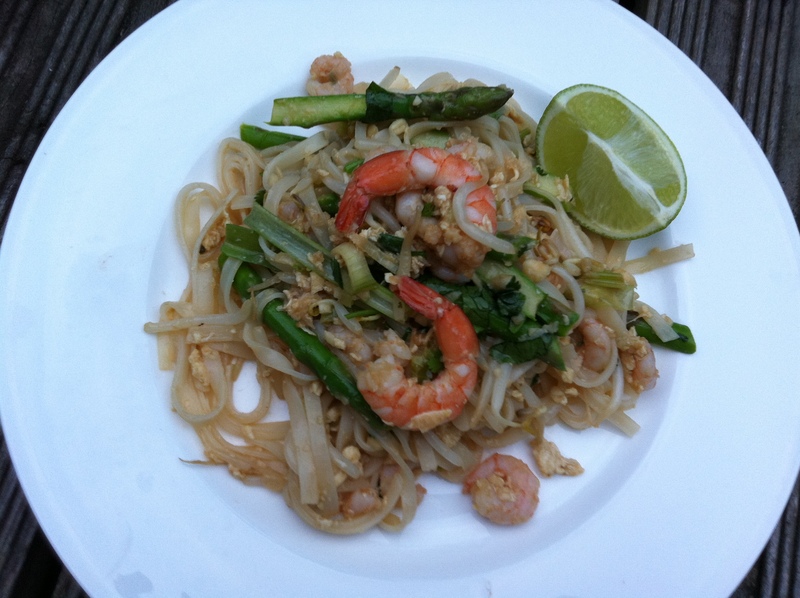 I love the flavours and textures of pad thai, and have long been searching for the perfect recipe. It’s not the most exciting dish to order when eating out, and I often find restaurant versions a little too sweet for my liking anyway (says the girl who can eat her own body weight in brownies, but that’s different, that’s baking), so pad thai seemed to be the perfect candidate for a simple home-cooked supper. But is it actually that simple? I’ve always been slightly daunted by the quantity of ingredients that go into this dish. Once you start listing them (as I’ve done below), the sheer volume really seems to stack up. What’s the best order to add everything? Will I forget a key ingredient? And what about that slightly scary scrambled egg bit? The answer is preparation. If you get everything prepped, chopped and ready in bowls (a la Saturday Kitchen or Delia circa 1995, that spontaneous Jamie Oliver malarkey cuts no mustard here), it’s pretty much just a straightforward assembly job. Pad thai is also a matter of taste. After scouring a bunch of recipe books, I moved my research online, where by far the most fascinating article I read was on Chez Pim’s site. It’s well worth a read. Rather than providing a recipe, she takes the reader on a detailed journey through the various stages of cooking; the importance of preparation, of getting your wok to the right temperature, of tasting your sauce for the right balance of salty, sweet and sour and of allowing yourself to be guided by your personal tastes. Yes, there are certain elements that constitute a classic pad thai, but if you like peanuts, add a few more. Hate beansprouts? Leave them out. Being of a slightly snobby food blogger disposition, I’ve gentrified my version to include fresh prawns rather than dried and added a little blanched asparagus for texture. I didn’t have any salted radish so that’s not made it into this recipe, and since even uttering the word ‘tofu’ makes Carniverous Boyfriend run a mile, I’ve left that out too. If you want do want to include it, make sure you use a firm variety and add at the beginning with the prawns (chicken would be good too), making sure it’s nicely crisped and brown before adding the next ingredients. This recipe pretty foolproof. Make your sauce, prep your ingredients and the whole thing can be thrown together in minutes. I wouldn’t advise making much more than the quantity below at one time as the volume of ingredients in your wok can become a little unwieldy, with the noodles sticky and overcooked. If you want to cook for four people, it might be worth making it in two batches, ensuring your pad thai performs ‘a footloose dance in an ultra hot wok’. Pim’s words, not mine, but a great way of summing up the casual simplicity of this dish. Alternatively you could stick to the quantities below and make it for just one other special person. I promise it will make them love you very much. Mix together all the ingredients for the sauce in a small bowl. 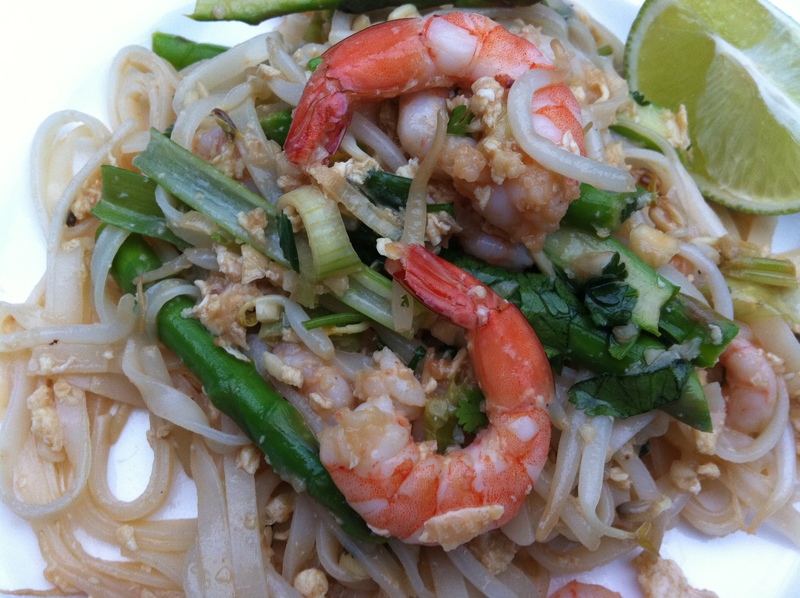 Adjust quantities to taste – pad thai should be the perfect balance of salty, sweet and sour. Set aside. Soak the noodles in warm water until soft, but not slimy (no more than 15 mins). Blanch them in boiling water for just a moment, then drain (if they start to stick together you can always rinse them in cold water to loosen up the strands again). Heat the oil in a wok until smoking. Add the chopped spring onions, shallot, garlic and chillies and warm for a couple of minutes before adding the prawns and cooking until fragrant and lightly coloured. Move the prawns to one side of the wok with a flat wooden spatula and pour the eggs into the other side. Leave to set for around 10 seconds, then break up the omelette-like mixture into small pieces with your spatula and stir until cooked through. Add the blanched noodles and your pre-made sauce and stir until thoroughly combined. Stir in the beansprouts and asparagus until warm and fully incorporated, then mix in two thirds of the peanuts. 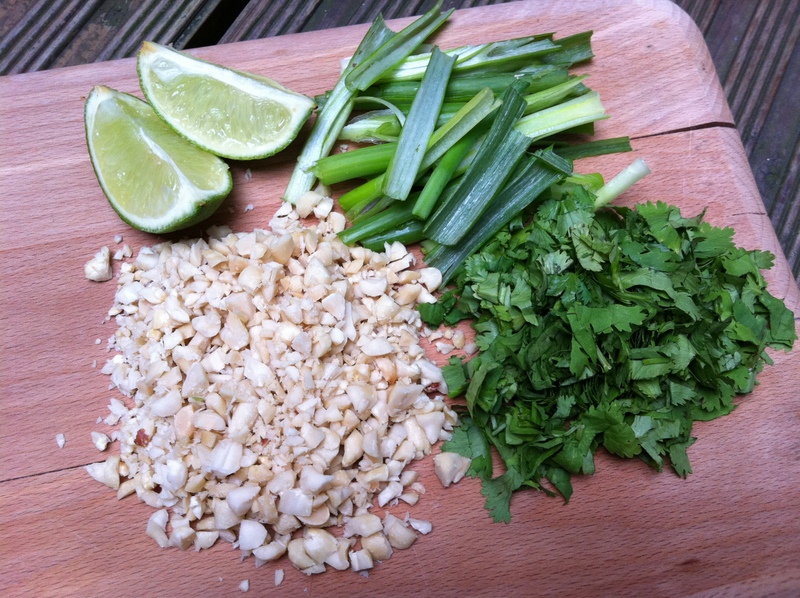 Turn off the heat and stir in the sliced spring onion and coriander. Squeeze over the juice of half a lime. Dish out onto two plates, sprinkle with the remaining peanuts and serve with a wedge of lime. Yum- looks utterly scrummy and a fab read. My boyfriend was the same with tofu too but then I got him on Ottolenghi’s black pepper tofu dish and now he’s hooked..try it! Good to know you can use chicken instead of prawns. This is the only pad thai which I remember that doesn’t have lemongrass or galangal in. This is excellent news as I can’t stand either! What could you use instead of the fish sauce? I can’t eat fish or shellfish you see. I think you can buy vegetarian fish sauce (!) nowadays, but failing that I’d just try good old soya sauce for that salty kick. Asparagus…tut tut. Hope it wasn’t from Peru! Haha. Looks very good though – glad I’ve already had my dinner otherwise i’d be pretty jealous. I hang my head in seasonal shame 🙂 tastes pretty good though! You could substitute green beans or little strips of courgette if you’re saving on air miles, or just enjoy during British asparagus season. ps there’s a little thai grocer’s shop on shepherd’s bush road. salted radishes and everything! Bishie – so glad you enjoyed! Daniel – thanks for the top tip. Nice and close to me so will check it out! Pad thai is definitely one of those dishes that I’ve always been too scared to try and make it home but maybe I’ll give it a go now! Thanks Kathryn, you should! It’s so simple and delicious. I love pad thai, but I’ve been a little too intimidated to try it on my own. Thank you for your thorough research and explanations of the dish. I’ll definitely refer back to this post when I get ready to make some! Mhmm…I will really give it a go – I love Pad Thai and it is impossible to find good ones in any of the Thai restaurants in England (at least nothing compared to what one eats in Thailand). Thanks! Cookie and Kate – this recipe is so easy. Lots of ingredients, but then you just throw it all together. Hope it works for you! 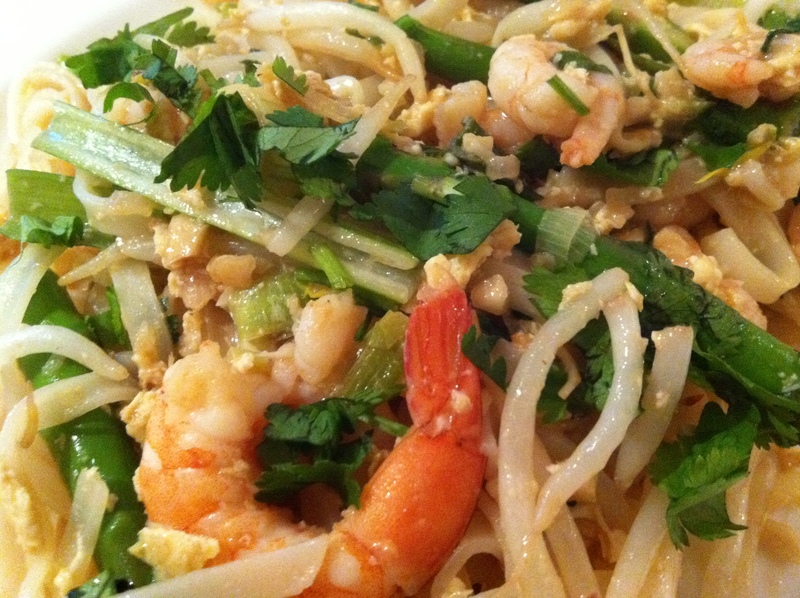 I adore Pad Thai and loved reading the story behind its creation. There is nothing better than the texture of this dish and yours looks recipe-worthy. I used cooked chicken as not a prawn fan it was delicious, I will keep in my favorite recipe book.